Last week, I had the opportunity to go to a Meet the Teacher. Our school does this every year. It's a great way for the teacher, kids and parents to meet, connect, and be ready for the start of school. The teacher gets our (parent) contact information, puts a face to a name, and is able to set up best contact method for the school year. Kids get to see who is in their class, see the classroom, figure out where it is. Parents get to shake hands, connect, etc. It builds comfort all around, connects people who need to be connected, and is a great thing to do. I'm sorry to hear it's not common everywhere. It makes me more grateful for it, though. I wanted to get to know our teacher, who is brand new to the school, so I crowdsourced my Facebook community for ideas of great questions to ask when I met the teacher, just to get a little sense of who she is. I was stunned by how many people thought I did not have the right to or should not talk to the teacher, ask her any questions, or get to know her. Confessing: I was a little taken aback, truth be told. Why were people so discouraging about this? The purpose of the event is to Meet the Teacher. The teacher is new. The teacher EXPECTED parent questions and came with information and prepared to talk to parents and answer questions. She said so herself. Custom may vary at other school meet the teachers. In our school, it seems quite common for parents to come in, greet the teacher, chat, and get to know one another. That's beneficial for both teacher and parent, in my opinion. I'm sure we learned a helpful amount in our short chat. For example, I learned she likes technology and had a great app for communicating with parents, and she learned I thought that was fantastic. We chatted about kid birthdays. I learned she has some good teaching experience behind her and has a good approach to individual learning. She learned I am happy to help support classroom things as needed. She learned we are teaching the kids budgeting at home, which means my daughter will understand the sticker economy the class uses. I was one of the first parents there so we chatted a few extra minutes than I'd thought to be able to, which was very nice. Other parents trailed in and got their few minutes too. My daughter and the other kids explored the classroom, identified where they'd be sitting, figured out where bags went, got information from the teacher, who now also had faces to their names (though she'll get that nearly every day, but this was a casual circumstance). It was a very positive experience all around, I thought, though I know it is stressful for teachers to do all the setup and prep for it. I did say how much I appreciated that and gave a store gift card to help with any supplies she needed. Hopefully, it has come through how very beneficial and positive the meet the teacher with actual talking to the teacher is. It's not a parent-teacher in depth conversation, of course. Just a chat for a couple of minutes to get to know you a bit. As a parent, I am my child's greatest ally and advocate. I have the right to talk to the teacher and get to know her. She and I will be working together this coming year to educate my child. But when I asked my Facebook friends for ideas of questions to ask, aside from a few exceptions, I got the strong sense that people thought I had no place, no right, to ask anything of the teacher. Teachers are so importuned, the message came across, that parents need to leave them be. Parents should not talk to teachers at meet the teacher, came the message. That sentiment troubles me greatly. Teachers have a wonderful job but, unfortunately, sometimes it is stressful and in terrible conditions. I can relate. I have had jobs like that too! Answering to dreadful bureaucracy, lacking resources and budget, dealing with coworkers or clients who are never satisfied or never have a good thing to say, worrying about job security and benefits, and on and on. Unlike for most challenged workers, people are aware that teachers have this situation. That provides an opportunity for mindful courtesy. Does that courtesy make them untouchable? It seems so for some people. The message was loud and clear: don't bother the teacher, don't trouble the teacher--asking questions and getting to know the teacher does both. I admit that if I had approached the teacher to get to know her and she seemed unapproachable or annoyed to chat, I'd have formed a very negative impression. I'd have grave concerns about our ability to communicate as parent and teacher working for the best for my child. And yet, I got the impression, from some teachers who commented, that they would not have welcomed a parent who approached to get to know them and ask a few questions. At our event, I was nowhere near the only parent to ask questions. There were all sorts of questions! When are bathroom breaks? What's the switch schedule and lunch? Do you need any supplies? Where were you before? When are you due? And some more in depth ones, such as the one I asked: How do you motivate kids to do what they need to do in class? Believe it or not, all of the questions were Good To Know. At our school, mostly parents want to back up the teacher and understanding things can help with that. Some parents simply introduced themselves. That has been me many years too. So if you are one who thinks a parent asking questions and getting to know the teacher at meet the teacher day is all wrong, defend your reason why. I'd like to understand your perspective on this. Or try to. 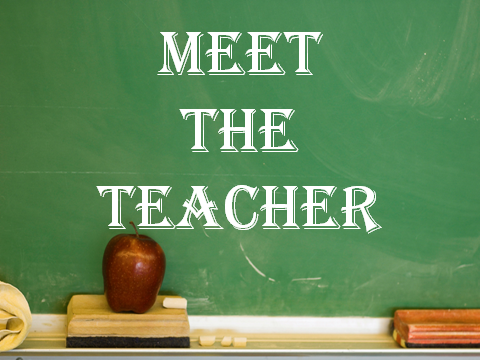 Other points of view are welcome to: do you think it's a good thing to do at meet the teacher? Have you met a teacher, asked a few questions, had a short chat? Don't make it about being selfish. It's not selfish to spend a couple of minutes connecting with your child's teacher at Meet the Teacher. Don't make it about being discourteous to other parents. The event is a full hour and every parent who wanted to had the chance to speak with the teacher. Nobody "hogged" the teacher. Everyone took a couple of minutes to chat as they wanted. Don't make it about "it's for the kids, not for you." That's junk science. Parents are invited to meet the teacher to meet the teacher too. Kids get the chance to say hi, but mainly they want to run with friends and see the classroom. If you stay the full hour, there is ample time to chat with the teacher for a few minutes and explore the classroom with your child. Be clear: I use the word chat on purpose. That's to make it clear it is a short, light, conversation. It's to differentiate it from an in depth conversation like you might have at a one on one conference. Be clear: when I say a few minutes, I do mean a few minutes. I mean 3ish more or less. So why do you think people were so inclined (in the majority) to discourage me from talking to the teacher and asking her a couple of questions at meet the teacher? One Friday a few weeks ago after a meeting in town, I dragged my kids to the Houston Museum of Natural Science. The real Magna Carta was on display in a special exhibit and I thought we absolutely had to go. How often do you get to see a document that is, at least in part, the foundation of the democracy in which you live. Or be near something that survived so much: strong desire for oppression, wars, and time. 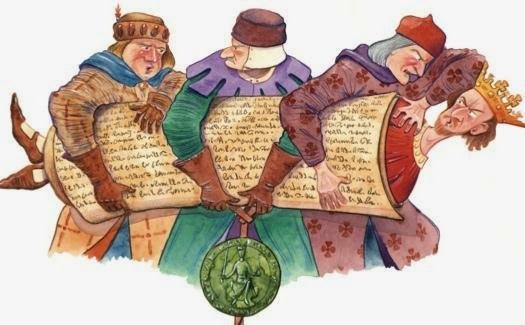 Sure, it didn't all work out at the time, but the idea took root and finally, about 500 years later, some other men in a not-quite-yet country wrote another document demanding protection of their rights and property against a tyrannical king. This time, a Pope couldn't quash it and neither could a king. It is still the foundation for the United States today. Lately, I've had a feeling we are a little less concerned with the law of the land as it pertains to due process and more married to the idea of hastily constructed personal or media kangaroo court and vigilante "justice." I looked at that document and thought about those nearly ancient barons. Sort of middle class, they were being bled dry (figuratively and literally) by the King. They just wanted some rights, some liberties. A little comfort. The idea that they weren't subject to the arbitrary whims of those in power, such as the King. I suspect they were tired and just wanted to be able to sleep peacefully at night. They didn't want to worry about walking down the street and getting piked by a king's man because the king took umbrage to something they did or didn't do. They may also have been tired of having no sovereignty that seemed to pair logically with their status as freemen. These barons, radical as they might have been, no longer wanted what they had to be fair game for seizure on a King's whim. 29. NO Freeman shall be taken or imprisoned, or be disseised of his Freehold, or Liberties, or free Customs, or be outlawed, or exiled, or any other wise destroyed; nor will We not pass upon him, nor condemn him, but by lawful judgment of his Peers, or by the Law of the land. We will sell to no man, we will not deny or defer to any man either Justice or Right. The Magna Carta, this long history, the barons, and because of my recent trip to Philadelphia, the founders of the US were heavily on my mind this month when another black teen was shot dead by a police officer in Missouri. What happened from there told me we have utterly forgotten due process. Too many of us have subscribed to the concept of immediate lethal force, forgetting rights, forgetting there are alternatives to solving a situation without execution. The news is full of tragic stories of terrified people leaping to lethal, excessive force first and suffering for it later: a police officer who mistakenly shot his daughter, a grandmother who mistakenly shot her young grandson, and so on. All believing that due to a noise they heard, they were at risk of their lives so had to kill. Ruled, harmed, by too much fear. What happened from there also told me we have also forgotten the First Amendment: "the right of the people peaceably to assemble, and to petition the Government for a redress of grievances." We do have a grievance: people--statistically particularly black men and youths--are being deprived of life without due process of law. There are a lot of details people are miring themselves in, about the right to bear arms, the right to protect yourself using lethal force, and how people who get shot probably deserved it. The real conversation is the right to not walk down the street worried you will be deprived of life without due process of law...by those sworn to uphold the law. It's important to know that as freemen and women we will not be condemned but by lawful judgment of our peers. Like the barons of old, we need to be able to walk down the street without fear of being piked by the king's men aka shot by police. I say we because I do think it applies to us all. I say we because I stand with my fellow mothers who are forced to teach their children how to walk, talk and act in the presence of police because, without due process, they are outlawed because they are black. I stand with the fathers who send their teen sons out with added worry beyond the usual parental concern about youth out and about. I stand with my people--because we are all people together--who walk on the same streets but a different path because of skin color. It's not okay. It's that simple. I support the very understandable grievance and desire to air it to our government, whose representatives are too often acting outside of due process outlawing, exiling and depriving of life. Leaders through time have stood consistently for justice, for rights and liberties of people. It was not easy for the barons in 1215 nor was it easy for the Philadelphia Convention in 1787. Both the Magna Carta and the Constitution have been fiercely debated ever since their inception. The Magna Carta was reconfirmed somewhere between 32-45 times. It's okay that we need to have the discussion, the reconfirmation, but we NEED to have it and it needs to be now. This is the basis of our civilization and our culture. Before one tin soldier is all that is left to ride away.